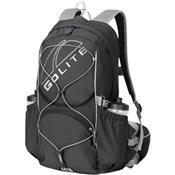 You feeling lucky' Goodthe GoLite VO24 Backpack was built as a lean, mean gear hauler for all your rabbit-foot-mandatory endurance adventures. Cinch down the sternum strap, adjust the detachable Convertabelt waist-belt then wave adios to the crowd and aid stations. You won't be stopping at those nightmarish clusters, thanks to the 3-liter hydration capacity and dual water-bottle sleeves. Set your eye on number onemesh-lined back, hip, and shoulder panels quickly wick your sweat away during the day, and reflective trim keeps you visible so you can push through the night.